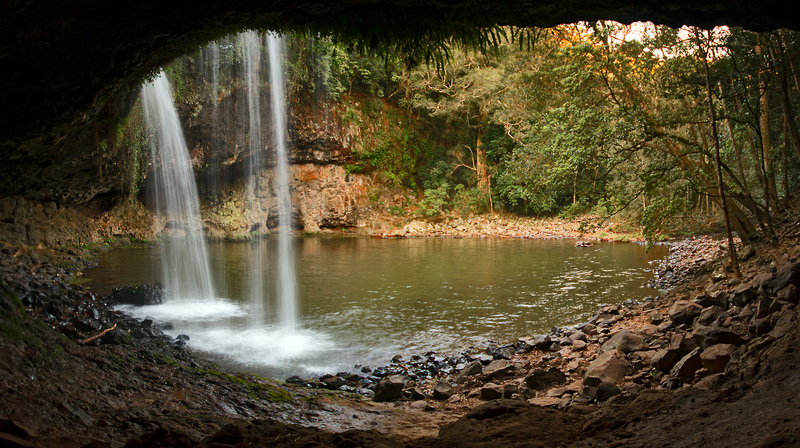 Killen Falls are near Byron Bay – another lovely part of the world within a drive from Brisbane.. This shot was taken late in the day, with the sun coming from upstream – to the left of the image. In the mornings I imagine the sun would fall directly on the falls. The creek continues downstream in the far left of the frame. This shot is a composite of several shots taken from underneath the overhang. The ground here was quite wet and slippery and the sun was setting, so I did not try to get over there. I wanted to because looking down the creek may have been a nice composition.